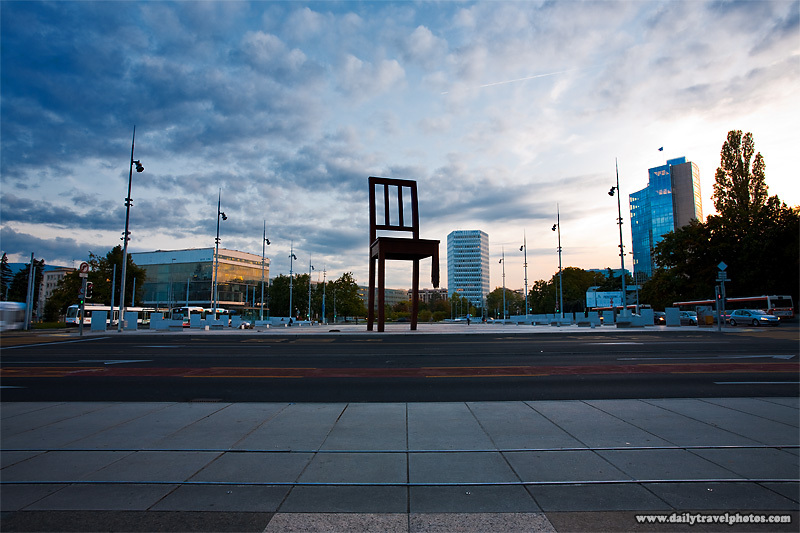 Broken chair "art" at the Place des UN, the European headquarters of the United Nations. 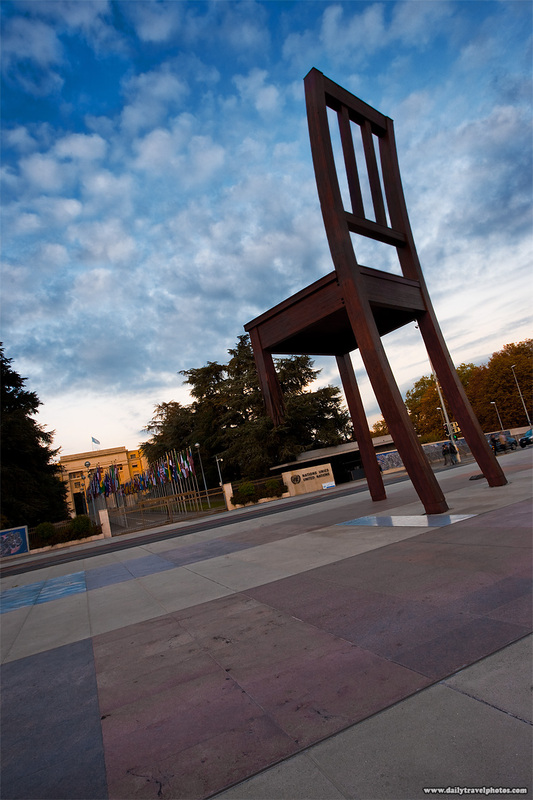 The legless chair at UN Plaza in Geneva represents the victims of land mines throughout the world. Robbery update: Anger has given way to acceptance and I've stopped mulling the events of the pickpocketing over in my head. Subsequent anger for the Geneva police, began in earnest. The computers were down at the station last night so I was forced to return today to file a report. However, the helpful guys from last night were replaced by Neanderthals working the afternoon shift. My initial question, as always, was a polite, (in French) "Do you speak English?" The policemen scoffed and enlightened me by saying (in French), "We're in Geneva. I speak French and Swiss." I asked (in broken French) if there is anyone that speaks English to which he continued speaking French but at a faster, unconcerned clip. It was obvious he wasn't planning to try to accommodate me so I continued in my remedial French and explained the best I could using hand motions that I had something stolen from me. His reaction was the same: fast, incomprehensible French. After a few more attempts on my part, I finally lost it. Normally, a helpful person, despite a language barrier, will attempt to slowly understand and be understood but it was obvious this high school drop-out, in a country where people are, at a minimum, tri-lingual (French/German/English) clearly had no intention of helping me. Therefore, I ran off a series of insults in English to which his ears perked up and he directed me towards the door, saying, "Allez-y"... Go there. My instincts tell me he fully understood what I was saying, even the English parts but since I'd interrupted his lunch, he seemed quick to want me to leave. For those of you that find yourself in a similar situation, know that in Geneva, crime-fighting takes a break between noon - 2pm. Crime is rampant in Geneva. Walk along the lake promenade and you see three card Monty offered by shady eastern Europeans every 30 meters. Unlicensed street prostitutes advertise their wares with impunity and useless young slugs of Arab descent loiter, looking for fresh tourists to pickpocket. The police know everything that's happening, yet they do nothing about it. Hopefully by tomorrow, my anger against the police will fade but suffice it to say, I'm ecstatic to leave this expensive, crime-ridden city in less than a week. Closeup of the broken chair art installation at UN plaza in front of the European headquarters of the United Nations.